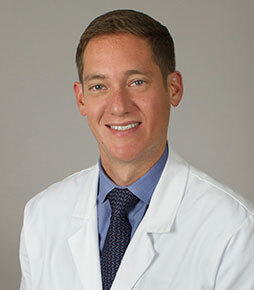 Dr. Alexander Weber is a specialist in the field of orthopaedic surgery and sports medicine at USC. Dr. Weber’s practice has an emphasis on arthroscopic surgery of the shoulder, elbow, hip, and knee. He also has specialized training in all types of shoulder replacement. He has research and clinical interests in the treatment of the athlete’s hip and biologic solutions to cartilage restoration. He has lectured nationally and internationally on hip arthroscopy for the treatment of FAI and cartilage preservation/restoration of the knee and has authored scientific articles and book chapters that advance the clinical practice of orthopaedics and sports medicine. Dr. Weber has a keen interest in caring for athletes across the spectrum from youth football to collegiate hockey to professional baseball (Chicago White Sox) and basketball (Chicago Bulls). Currently, Dr. Weber serves as a team physician for the USC Trojans. Restoring form and function is always his primary objective, whether his patients are a competitive athlete or suffering from a nagging injury. He firmly believes that the key component to achieving this primary objective is listening to the patient. Each patient knows his or her body best! As a team, he and his patients formulate treatment plans that incorporates their individual goals and objectives. He is well-trained in the most modern biologic and surgical treatment modalities, but he promises to exhaust all non-surgical options before considering surgery as part of the treatment plan. Great-West Healthcare of California, Inc.